Let's say I have a 4-core CPU, and I want to run some process in the minimum amount of time. The process is ideally parallelizable, so I can run chunks of it on an infinite number of threads and each thread takes the same amount of time. Since I have 4 cores, I don't expect any speedup by running more threads than cores, since a single core is only capable of running a single thread at a given moment. I don't know much about hardware, so this is only a guess. Is there a benefit to running a parallelizable process on more threads than cores? In other words, will my process finish faster, slower, or in about the same amount of time if I run it using 4000 threads rather than 4 threads? If your threads don't do I/O, synchronization, etc., and there's nothing else running, 1 thread per core will get you the best performance. However that very likely not the case. Adding more threads usually helps, but after some point, they cause some performance degradation. Not long ago, I was doing performance testing on a 2 quad-core machine running an ASP.NET application on Mono under a pretty decent load. We played with the minimum and maximum number of threads and in the end we found out that for that particular application in that particular configuration the best throughput was somewhere between 36 and 40 threads. Anything outside those boundaries performed worse. Lesson learned? If I were you, I would test with different number of threads until you find the right number for your application. One thing for sure: 4k threads will take longer. That's a lot of context switches. Note that all threads work on one array but different ranges (two threads do not access the same index), so the results may differ if they've worked on different arrays. The 1.86 machine is a macbook air with an SSD. The other mac is an iMac with a normal HDD (I think it's 7200 rpm). The windows machine also has a 7200 rpm HDD. In this test, the optimal number was equal to the number of cores in the machine. I know this question is rather old, but things have evolved since 2009. There are two things to take into account now: the number of cores, and the number of threads that can run within each core. On other processors you may have 2, 4, or even 8 threads. So if you have 8 cores each of which support 8 threads, you could have 64 processes running in parallel without context switching. "No context switching" is obviously not true if you run with a standard operating system which will do context switching for all sorts of other things out of your control. But that's the main idea. Some OSes let you allocate processors so only your application has access/usage of said processor! The actual performance will depend on how much voluntary yielding each thread will do. For example, if the threads do NO I/O at all and use no system services (i.e. they're 100% cpu-bound) then 1 thread per core is the optimal. If the threads do anything that requires waiting, then you'll have to experiment to determine the optimal number of threads. 4000 threads would incur significant scheduling overhead, so that's probably not optimal either. The answer depends on the complexity of the algorithms used in the program. I came up with a method to calculate the optimal number of threads by making two measurements of processing times Tn and Tm for two arbitrary number of threads ‘n’ and ‘m’. For linear algorithms, the optimal number of threads will be N = sqrt ( (mn(Tm*(n-1) – Tn*(m-1)))/(nTn-mTm) ) . 4000 threads at one time is pretty high. The answer is yes and no. If you are doing a lot of blocking I/O in each thread, then yes, you could show significant speedups doing up to probably 3 or 4 threads per logical core. If you are not doing a lot of blocking things however, then the extra overhead with threading will just make it slower. So use a profiler and see where the bottlenecks are in each possibly parallel piece. If you are doing heavy computations, then more than 1 thread per CPU won't help. If you are doing a lot of memory transfer, it won't help either. If you are doing a lot of I/O though such as for disk access or internet access, then yes multiple threads will help up to a certain extent, or at the least make the application more responsive. I thought I'd add another perspective here. The answer depends on whether the question is assuming weak scaling or strong scaling. Weak scaling: how the solution time varies with the number of processors for a fixed problem size per processor. Strong scaling: how the solution time varies with the number of processors for a fixed total problem size. If the question is assuming weak scaling then @Gonzalo's answer suffices. However if the question is assuming strong scaling, there's something more to add. In strong scaling you're assuming a fixed workload size so if you increase the number of threads, the size of the data that each thread needs to work on decreases. On modern CPUs memory accesses are expensive and would be preferable to maintain locality by keeping the data in caches. Therefore, the likely optimal number of threads can be found when the dataset of each thread fits in each core's cache (I'm not going into the details of discussing whether it's L1/L2/L3 cache(s) of the system). This holds true even when the number of threads exceeds the number of cores. For example assume there's 8 arbitrary unit (or AU) of work in the program which will be executed on a 4 core machine. Case 1: run with four threads where each thread needs to complete 2AU. Each thread takes 10s to complete (with a lot of cache misses). 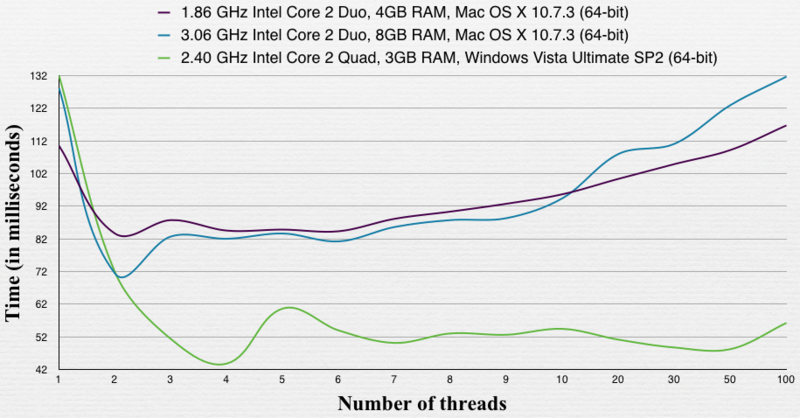 With four cores the total amount of time will be 10s (10s * 4 threads / 4 cores). Case 2: run with eight threads where each thread needs to complete 1AU. Each thread takes only 2s (instead of 5s because of the reduced amount of cache misses). With eight cores the total amount of time will be 4s (2s * 8 threads / 4 cores). I've simplified the problem and ignored overheads mentioned in other answers (e.g., context switches) but hope you get the point that it might be beneficial to have more number of threads than the available number of cores, depending on the data size you're dealing with. I'd start ramping up the number of threads for an application, starting at 1, and then go to something like 100, run three-five trials for each number of threads, and build yourself a graph of operation speed vs. number of threads. You should that the four thread case is optimal, with slight rises in runtime after that, but maybe not. It may be that your application is bandwidth limited, ie, the dataset you're loading into memory is huge, you're getting lots of cache misses, etc, such that 2 threads are optimal. You can't know until you test. You will find how many threads you can run on your machine by running htop or ps command that returns number of process on your machine. You can use man page about 'ps' command. If you want to compile htop from source code, you will find it here. The ideal is 1 thread per core, as long as none of the threads will block. One case where this may not be true: there are other threads running on the core, in which case more threads may give your program a bigger slice of the execution time. One example of lots of threads ("thread pool") vs one per core is that of implementing a web-server in Linux or in Windows. Since sockets are polled in Linux a lot of threads may increase the likelihood of one of them polling the right socket at the right time - but the overall processing cost will be very high. In Windows the server will be implemented using I/O Completion Ports - IOCPs - which will make the application event driven: if an I/O completes the OS launches a stand-by thread to process it. When the processing has completed (usually with another I/O operation as in a request-response pair) the thread returns to the IOCP port (queue) to wait for the next completion. If no I/O has completed there is no processing to be done and no thread is launched. Indeed, Microsoft recommends no more than one thread per core in IOCP implementations. Any I/O may be attached to the IOCP mechanism. IOCs may also be posted by the application, if necessary. speaking from computation and memory bound point of view (scientific computing) 4000 threads will make application run really slow. Part of the problem is a very high overhead of context switching and most likely very poor memory locality. But it also depends on your architecture. From where I heard Niagara processors are suppose to be able to handle multiple threads on a single core using some kind of advanced pipelining technique. However I have no experience with those processors. Not the answer you're looking for? Browse other questions tagged parallel-processing cpu or ask your own question. Java multithreading - 6 threads or 30 threads? Number of threads vs processor core? Has anyone tried using the UV_THREADPOOL_SIZE environment variable? Why is this code getting faster when I'm using way more threads than my CPU has cores? How to do the same calculations faster on 4-core CPU: 4 threads or 50 threads?